Heat oven to 400° F. Grease 12-inch pizza pan. Unroll dough; place in greased pan. Starting at center, press out dough to edges of pan. Bake 10 to 12 minutes or until crust begins to brown. Meanwhile, cook beef in 10-inch skillet over medium heat, stirring occasionally, until brown; drain. Stir in sloppy joe sauce. 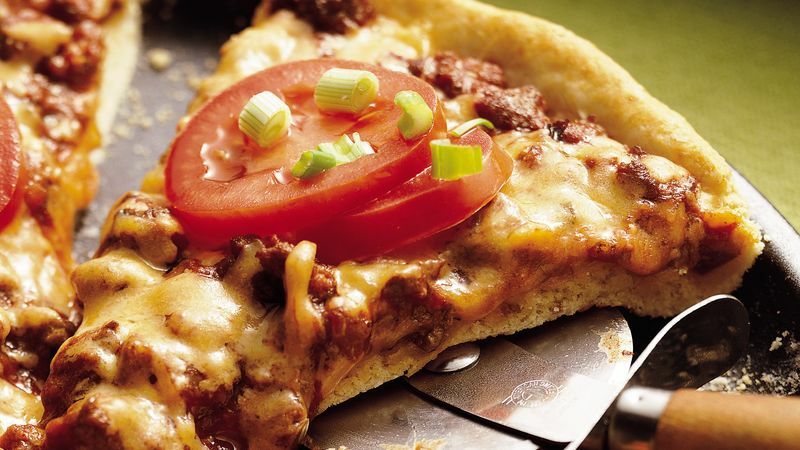 Spoon beef mixture over crust. Sprinkle with cheese. Bake an additional 10 to 12 minutes or until cheese is melted and crust is golden brown. Top with tomatoes and onions. For 5 grams of fat and 200 calories per serving, substitute ground turkey breast for the ground beef, and use reduced fat baking mix and reduced-fat Cheddar cheese. Increase water to 1/2 cup.